Emmeline Pankhurst, the grande dame of the suffragette movement, sent an angry telegram to the Australian Prime Minister Billy Hughes, condemning her daughter, Adela Pankhurst, for her opposition to World War I and compulsory conscription laws. The 26-word telegram, sent on 8 March 1917, has been uncovered by the University of Melbourne Archives. It reveals new insights into links between the British struggle for women’s rights and the emerging political landscape in Australia. The militant wing of the suffragette movement has been brought to new audiences with the recently released movie, Suffragette, which shows the confrontational history behind women seeking and finally receiving the right to vote in the United Kingdom. The movie ends before the declaration of World War I, but the war was to split the movement and its famous protagonists, in particular the Pankhurst family. The depth of this rift is revealed in this recently discovered telegram, which sheds new light on the struggles and disputes in this family and the early feminist movement. The telegram is part of a collection donated to the University by Percival Dean, and will be on display in the forthcoming exhibition, Somewhere in France. It shows the political links between the UK and Australian suffrage movements, as well as the emotional rift and fallout between family members, as Emmeline Pankhurst denounces her famous daughter to William Hughes, Prime Minister of Australia. The telegram is powerful new evidence of the intensely political nature of the suffrage movement and of the surprising political realignments sparked by the war. It also points to international connections between the suffragettes and the unionism and socialism movements. 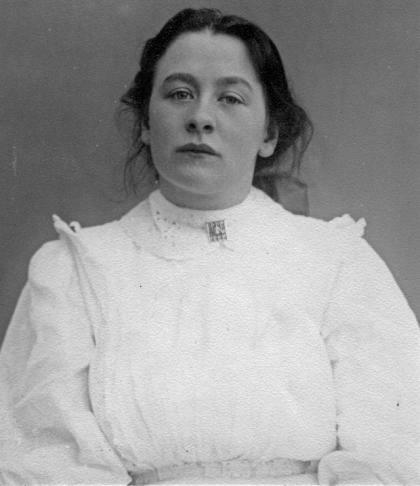 Adela Pankhurst left England due to health problems caused, in part, by her repeated imprisonments, but also due to an estrangement with her mother and sister Christabel over the direction of the Women’s Social and Political Union (WSPU). She arrived in Melbourne in April 1914, immediately joining Goldstein’s suffrage organisation the Women’s Political Association and, once it was formed, the Women’s Peace Army. Adela Pankhurst (1885-1961) was sent to Australia by her mother Emmeline Pankhurst arriving in Melbourne in 1914. In 1917, Adela Pankhurst joined and became an organiser for Tom Mann’s Victorian Socialist Party, a large and influential socialist organisation. She began a career of public speaking against the war and particularly against Hughes’ plans to introduce conscription. She wrote pamphlets and plays opposing World War I. This stand raised her mother’s ire. Emmeline Pankhurst supported the war and had come to an agreement with the British government to cease campaigning for suffrage. She even helped recruit young men for the war, a position that distinguished her from much of the suffrage movement. Much like her mother, Adela Pankhurst’s oratorical skill was renowned and she was invited to speak to anti-conscription meetings throughout the country. Women were a central part of the anti-conscription campaigns, which advocated a (successful) no vote in two plebiscites undertaken by the Hughes government, in October 1916 and December 1917. In Australia, non-Indigenous women had received the vote and the right to stand in federal elections by 1902. In Victoria, women were only granted the vote in 1908 and the right to stand as candidates in 1917. Vida Goldstein was Victoria’s leading suffragist, who began her political career helping her mother collect signatures on the huge Woman Suffrage Petition, now housed at the Public Records Office of Victoria. Emmeline Pankhurst’s WSPU invited Goldstein to the UK in 1911. Goldstein’s public activity was not confined to the right to vote; she campaigned for compulsory arbitration, equal pay and equal rights for women workers, against the White Australia policy and against capitalism. In 1915 she founded, along with Cecilia John, the Women’s Peace Army which called for the abolition of conscription and militarism and equal rights for women with the motto “we war against war”. William Hughes (1862-1952), Seventh Prime Minister of Australia (1915-1923). 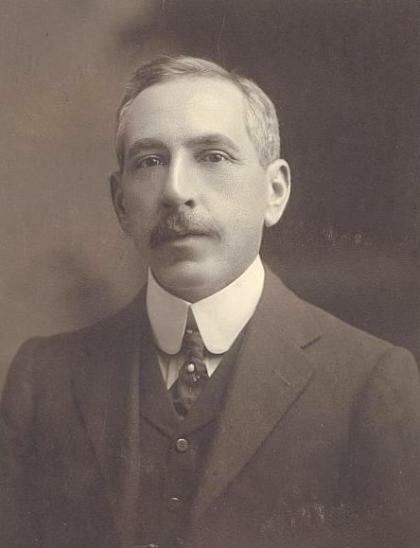 “Billy” Hughes was a strong supporter of Australia’s involvement in World War I and was strongly in favour of compulsory conscription. In late 1917, Baines and Pankhurst led large women’s marches in Melbourne against war profiteering and increased price rises. Press reports said the marches descended into riots. Both women were arrested and Pankhurst served four months after refusing Hughes’ offer of release on the condition that she not speak in public again. After the war, Pankhurst and her husband, Tom Walsh, leader of the Seamen’s Union, were founding members of the Australian Communist Party. Both moved politically to the right and by 1928 Pankhurst had founded the Australian Women’s Guild of Empire, a group that advocated cooperation rather than industrial action during the Depression. The threads connecting the suffrage movement, the unions and the socialist organisations through the years leading up to and during World War I are complex. But they tell of a fascinating period in which women activists were at the forefront of political agitation and change. Alongside this activity, it is also important to recognise the powerful political debates about theory and strategy that guided these activists in many different directions. The Suffragette movie is an interesting glimpse into one of these strands. The records these women have left behind tell a history even more profound and multifaceted. 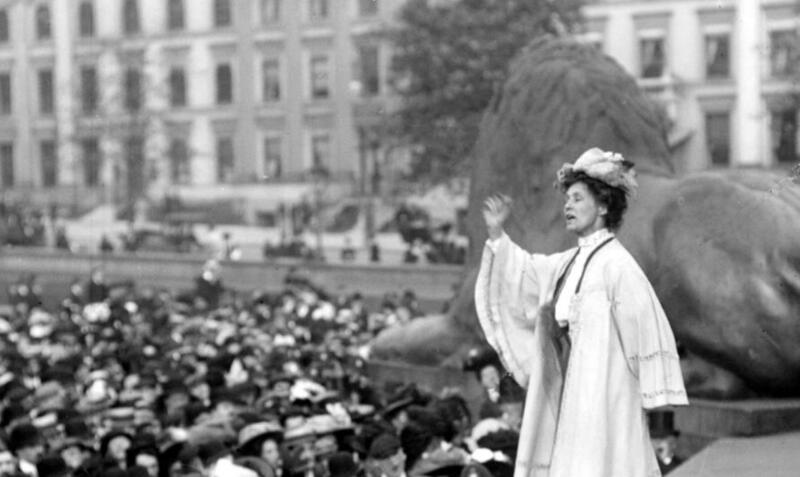 Suffragette Emmeline Pankhurst addressing a meeting in Trafalgar Square in London, 1908. The telegram from Emmeline Pankhurst to Billy Hughes can be found in the papers of Percival Edgar Deane. Deane was appointed Hughes’ Private Secretary in November 1916, a post he retained until he was appointed Secretary of the Prime Minister’s Department 1921-1929. His papers are a fascinating insight into the early years of the Australian public service. They also add a new dimension to our understanding of Billy Hughes. 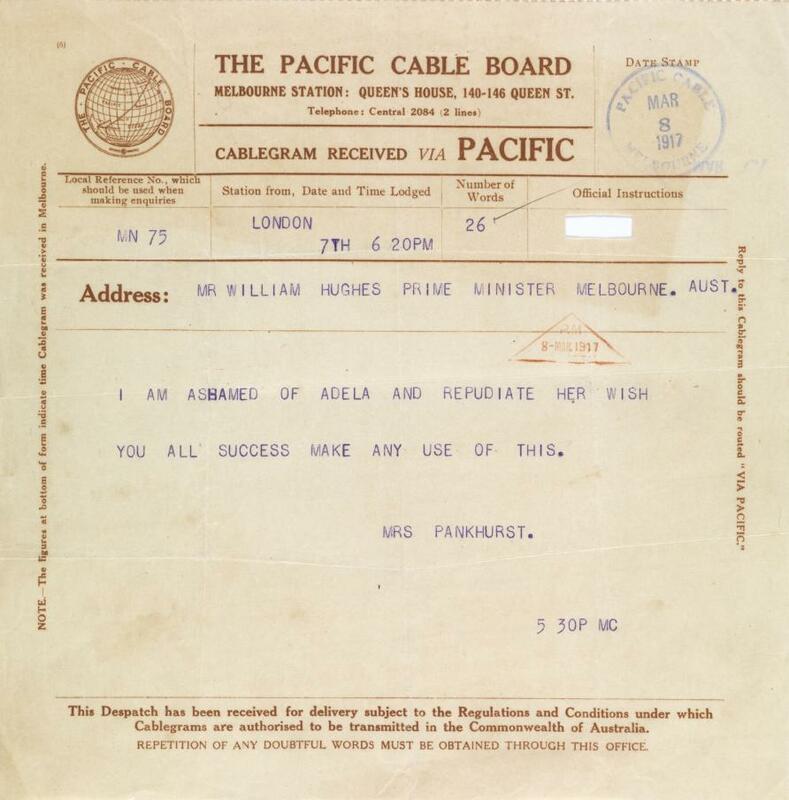 The collection contains correspondence from Hughes and documents relating to the Australian delegation to the Versailles Peace Conference in 1919. The highlights from this collection, including the Pankhurst telegram, will be on display in the forthcoming exhibition, Somewhere in France. This exhibition will explore how the experience of Australians on the Western front during World War I shaped new ways of imagining France. This is shown through diaries, letters, postcards, images and ephemera from the collections of the University of Melbourne Archives. The exhibition, sourced and curated by the University of Melbourne Archives, opens on March 10 2016 in the Noel Shaw Gallery at the Baillieu Library.